Acoustic control is an essential aspect of any air movement system with noise suppression legislation becoming ever more stringent. 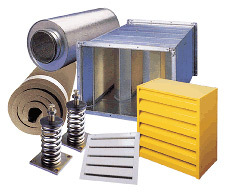 Our wide range of standard attenuators and bespoke acoustic enclosures can reduce existing noise problems and help to ensure systems are fully compliant. The successful integration of air movement, environmental management or ventilation systems into the fabric of your building whilst maintaining low noise levels can be a challenge. Alan Williams & Co engineers offer practical advice and use computer modelling software to select the correct acoustic products for the application.